Meet precious Tilken! Tilken had been living at a school district maintenance and supply storage yard for one whole year before he was rescued! His fur was so sun bleached that he looked like an entirely different colored bunny upon rescue. The pictures posted are how he looks today. It is amazing he survived that long in that in those circumstances. The predators he had to evade were coyotes, hawks, and owls. In fact, the day I rescued him, I was being dive bombed by a hawk as I was interfering with the hawks' lunch! 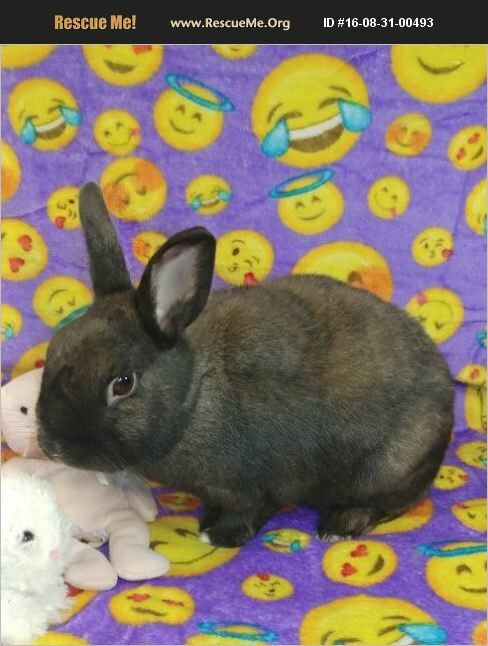 A total of three buns were rescued from this site. At least six more buns were living there but I was only able to rescue three before the other bunnies disappeared. So sad. Tilken is such a sweet boy and loves to chatter his teeth for you when he is getting petted. He is a really wonderful rabbit with a great temperament. He likes to be picked up, held and petted. He is bonded with Tilly (black rabbit who was also rescued at the same site) so they need to be adopted as a pair. They both have good litter box habits and currently reside in a exercise pen in my kitchen but they would really like a true home to call their own. They are ever so deserving. They are both small rabbits and an absolutely amazing, dynamite duo and not to be passed by! ************* Delivery available to greater Southern California region. Don't have the items you need to welcome a bunny to your home? No problem, we have x-pen enclosures, litter boxes, bunny litter, hay, food pellets and toys to make new bunny ownership easier for you. Or, if you prefer to get your bunny supplies ahead of time, please consult with me before you purchase them as I can direct you to the least expensive and most appropriate rabbit essentials. MAKE SURE TO CLICK ON THE VIDEO TO WATCH TOP 10 MISTAKES RABBIT OWNERS MAKE! MAKE SURE TO COPY AND PASTE INTO YOUR WEB BROWSER THE FOLLOWING LINK FOR RABBIT ADVICE! THE BIGGEST MISTAKES YOU CAN MAKE AS A RABBIT OWNER: https://www.thedodo.com/things-to-know-getting-rabbit-1340963451.html *********** Kribs for Kritters Rabbit Rescue & Sanctuary Find Kribs for Kritters on: https://www.facebook.com/kribsforkrittersofficial/ https://www.instagram.com/kribs_for_kritters/ I rescue domestic rabbits that have been cruelly abandoned at parks, golf courses, schools, fitness trails, and other outdoor locations. Rabbits are spayed/neutered if old enough prior to adoption. Spaying and neutering your rabbits will minimize behavior issues and prolong their life by preventing reproductive cancers from developing.